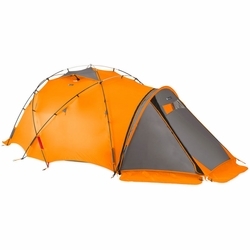 NEMO Chogori 3P Tent. This four-season tent delivers the first big innovation in mountaineering tents in decades. The integrated fly and external pole structure allows for set-up in half the time, a valuable time savings in extreme weather. This innovation also trims weight by 25%, while maintaining category-leading ventilation, vestibule space, and guy-out options. Link two Chogori™ tents together to create a larger, connected shelter in which to wait out the storm. Vestibule provides a window for visibility in the worst conditions. Aluminum DAC Featherlite NSL poles complement the fabric suite.